In 2000, only two years after its official launch, Google had already proved itself as a search engine with over 1 billion indexed web pages. So in order to diversify, it started selling ad space online: Google AdWords was born. Adwords allows businesses to serve ads on the Google advertising network. These ads are targeted based on keywords used in searches and on user-behavior. Ad space is sold on an auction and ad quality system. Among the milestones in Google’s history, 2006 is a year to remember with the acquisition of YouTube. That alone is a sufficient reason not to neglect video in your communication and marketing mix. What used to be an insignificant online network for Harvard students just a few years prior, opens up to the public in 2006. Following the massive phenomenon created by and around Facebook (1.79 billion users at the end of 2016, of which 31 millions in France), brands and companies inevitably started showing interest in the platform. In 2012, Facebook got into the advertising business: Facebook Ads were born. 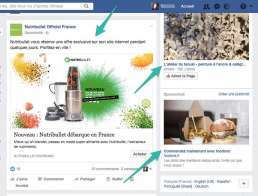 What is the differencebetween Google and Facebook advertising ? Google AdWords and Facebook Ads work with very different targeting logics. Google ads are displayed as search results to keyword-based searches. Ads appear when the user searches. Facebook ads are displayed based on user profile and interest targeting. What type of advertising ismost appropriate for my business ? There is no definite answer to this question. It all depends on the type of product or service your company offers and on the end goal of your advertising campaign. Are you interested in Facebook Ads or Google advertising for your business? Freelancer in digital marketing based in Paris, France. Soviral Marketing Consulting specializes in small business marketing. I offer services in online marketing: Community Management, Digital Strategy, Social Media Marketing, Facebook Advertising, Google AdWords and provide Training and Assisted Learning services for entrepreneurs, small business owners, startup businesses.